You are at:Home»Posts Tagged "“Terry Pratchett”"
Do you want to buy a castle? Should Secret Service agents be drunk? Christian Bale or Charlton Heston? Martha answers all. Martha makes the drive to Hollywood and gets roped into a podcast. GOOD OMENS PERFUMES. FOR A GOOD CAUSE. BUY THEM. NOW. No, Angel from Angel doesn’t count. Is this list extremely, almost bizarrely esoteric? Yes it is. But whatever. Apparently the concept meeting between Sir Terry Pratchett and Prime Focus was held at SFX magazine for some reason, and those nerds very smartly decided to record it. 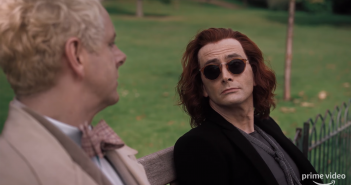 More specifically, two confusing and potentially contradicting good omens.